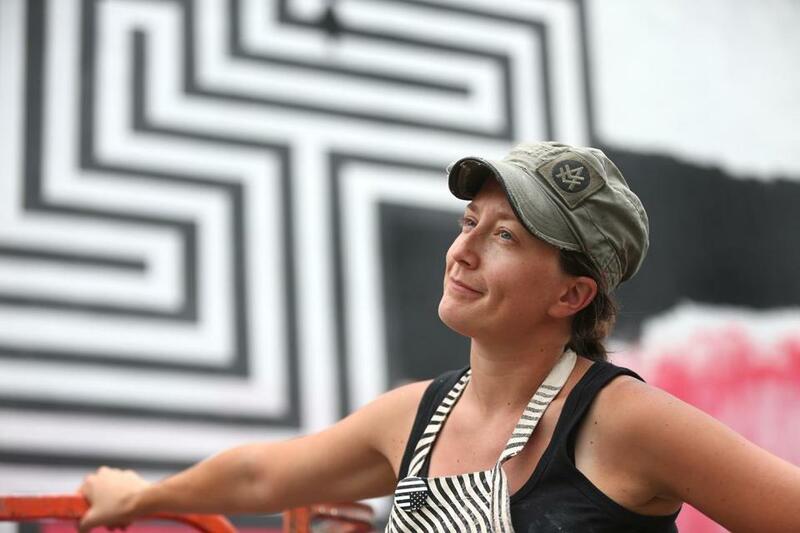 Laura Minot shielded her eyes from the afternoon sun and gazed up at the 45-feet-tall mural. The focal point of the piece — a blown-up photo of her face that had been glued to the wall — was missing, a casualty of a bad storm a few days before. Still, the artwork was much bigger than she expected. Laura Minot in front of the mural that was inspired by her and other residents of McGrath House in the South End. Minot is currently a resident at McGrath House, a 30-bed halfway center for adult female offenders in the South End. The mural was inspired by the experiences of those women. Called “See Her,” it is the first piece in a public art series, Year of the Woman, funded by the nonprofit Now and There. Featuring swaths of fluorescent red and a striking black-and-white maze-like design, it’s located at 808 Tremont St., in the South End. Ann Lewis, the Detroit artist behind the mural, said she took this project because of her commitment to illuminating social issues through her art. When she arrived in Boston, she met with Kate Gilbert, the executive director of Now and There, and brainstormed ideas for the artwork. Gilbert gave Lewis freedom to pick a topic she felt strongly about, as long as the artwork reflected an issue that affects Bostonians. 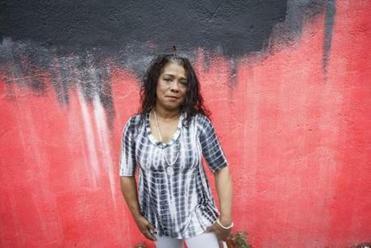 The artist decided to look into women’s issues and mass incarceration as possible subjects. Eventually, she stumbled across McGrath House through Community Resources for Justice, a social-justice nonprofit organization. 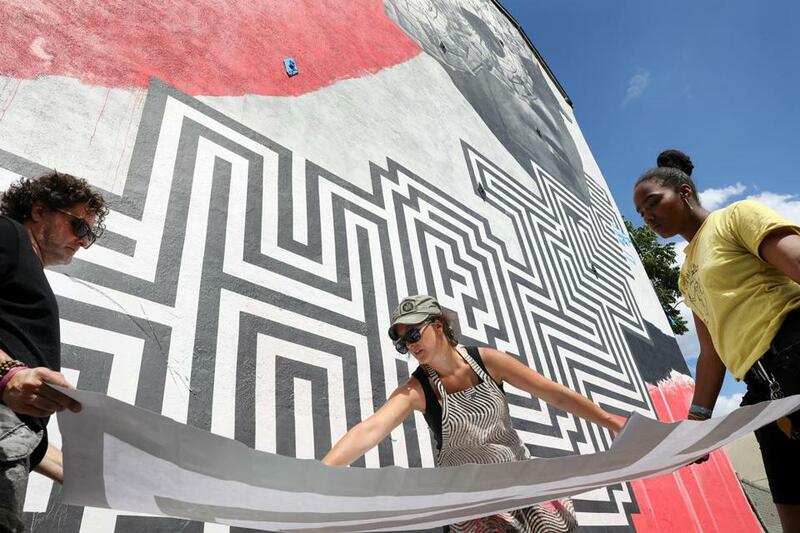 Assistants Luis German and Ryan Dias-Toppin help Detroit artist Ann Lewis work on the mural. Because she had seen the power of creativity while holding art classes for teenage defendants in New York, Lewis said she felt confident that the halfway center was the right starting point for the artwork. She organized a workshop at McGrath and paid the women for their time and creative energy. Together they made collages with pictures from magazines that represented what they hoped life after leaving McGrath would look like. Lewis used many of the images that came up in the women’s collages, such as a staircase, to conceptualize the design for the mural. She primed the wall and painted it before starting the wheatpasting process. Minot’s story in particular inspired Lewis, so she selected her portrait as the centerpiece for the artwork. The process of getting the mural up has not been easy. Gilbert worked with the Landmarks Commission and even spoke with the mayor’s office to get the necessary permits. Lewis battled sweltering afternoons, strong breezes, and the occasional shower — often in a cherry picker — to glue the laser-printed images to the wall. She frequently worked 14-hour days, using a light rigged to the platform after sunset to make sure everything was pasted precisely. Gilbert said the mural will be finished by July 18. She estimated the cost of the entire project to be $25,000. “This has been a labor of love,” she said with a laugh. “And determination,” Lewis chimed in. 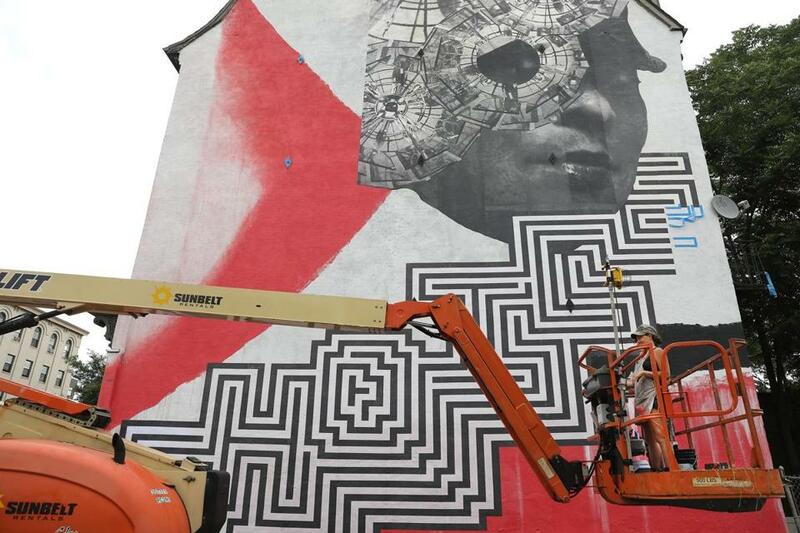 Within the maze, the artist has hidden a word laden with meaning for the McGrath residents — choice. It represents the decisions the women will have to make after their sentences end to become thriving members of their communities, as well as the choices their communities have to make to support them. Many of the McGrath women, including Minot, said they feel ashamed because of how their choices have affected their families. It’s now harder than ever for them to get jobs. Most of them have children at home. One said she lies to her youngest son because she does not want him to know where she really is. They all stressed that their experiences are vastly different from those of male offenders, and that the resources provided are simply not adequate. Lisa Chute, the assistant program director at McGrath House, said women always feel like they have more to lose when they go to prison. But Minot said she believes women are more motivated to turn their lives around after their sentences because they have more on the line. She doesn’t plan on going back to prison and is currently searching for a job. 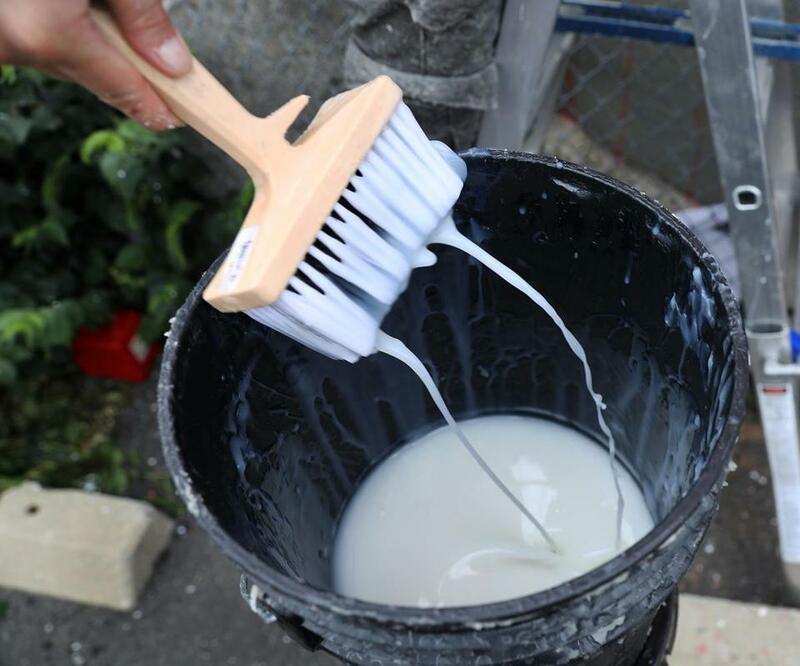 Wallpaper adhesive is used to affix the mural to the building on Tremont Street.